One challenge I always put my name in the hat for Art Jewelry Elements Component challenge. 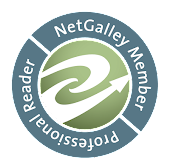 Each month one of the blog team members will design up an art element and share it with the rest of the team. They are also kind enough to invite in some guest designers. And you guessed it, I was lucky enough to be one of the designers chosen this month. This first hop of the year is a bit different then from the past because each of the blog team donated an item from their stash. My name was drawn for Jenny Davies-Reazor who creates fabulous ceramic focals and beads. Jenny had actually donated a couple focals for the cause and she was quick to assure me that I only needed to work with one. But just look at those focals? Could you choose just one? I started out working with the focal on the left. That tree really reminded me of an ancient one that grows in the center Circle. I pictured women in the far past dancing around it to celebrate the changing of seasons. Circle Dancing features that gorgeous focal along with recycled Indonesian glass beads and pewter beads hand knotted on Irish Waxed Linen. It is finished off with a pewter clasp. And since it really is about the focal, here is a close up. I am not sure how other designers work but as part of my design process, play around with different looks and styles in my mind before I ever start playing with the beads. 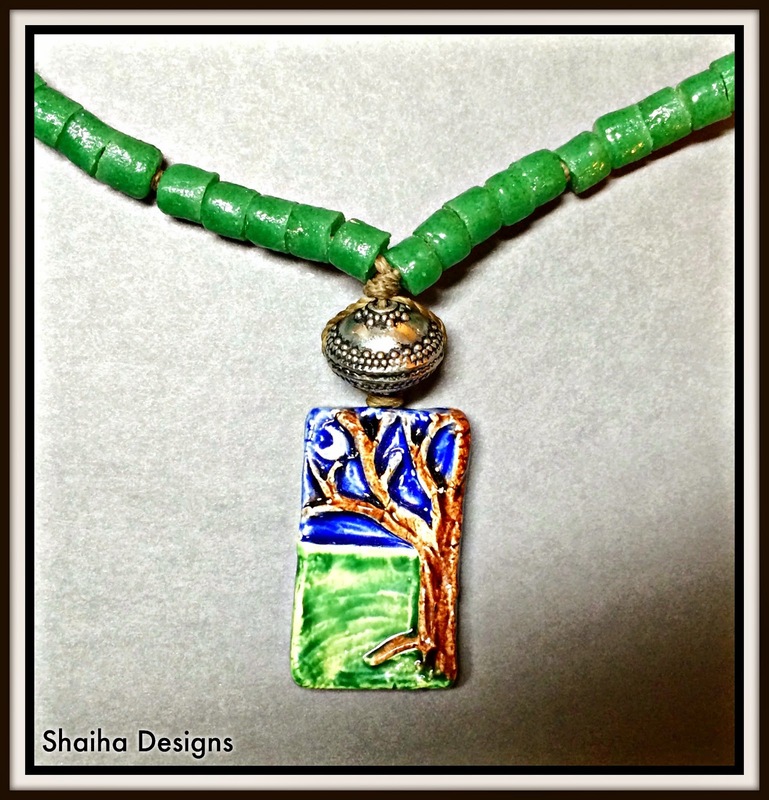 This next necklace started with thoughts of turquoise and more ceramic beads. Then it went to thoughts of navy blue seed beads. 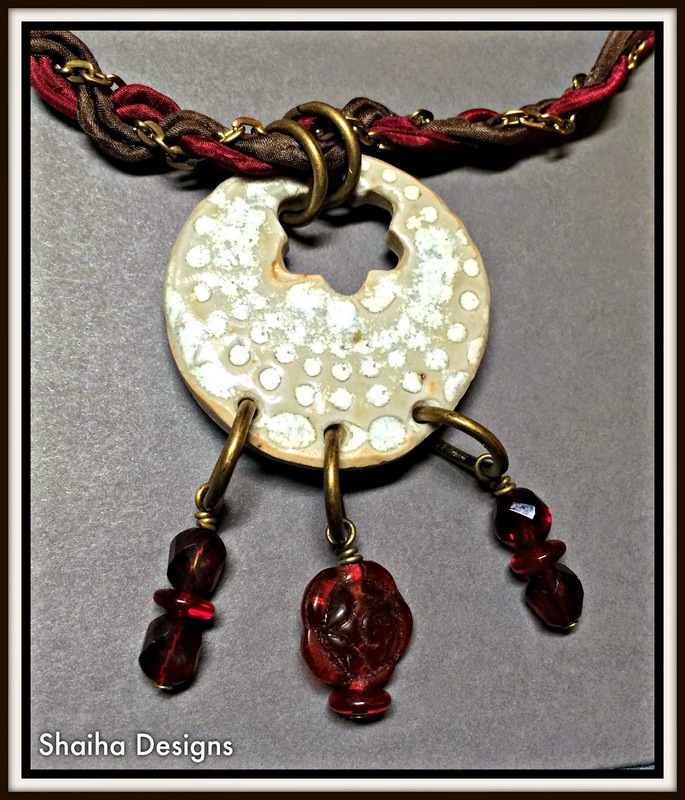 It was when I stopped by to visit this focal and I noticed some new Czech glass beads that I had picked up in a destash that the name 'Roses In The Snow' popped into my mind along with the design.. This design is a departure from my usual in that I finally incorporated in some of the silk strings that I have been hoarding. (And I do mean hoarding. I picked them up a few years ago and they have just been decorating up my studio since.) After braiding them with some brass chain, I attached the braid to some heavier brass chain so the necklace is adjustable. To this glorious focal, I added some Czech glass beads, crystals and some vintage lucite. Did I do her justice? I also want to thank Art Jewelry Elements and Jenny Davies-Reazor for inviting me to play with you this month. Now this is a challenge so be sure to check out what everyone else made. Remember, we all got different art components to play and I can't wait to see just what everyone else came up with. 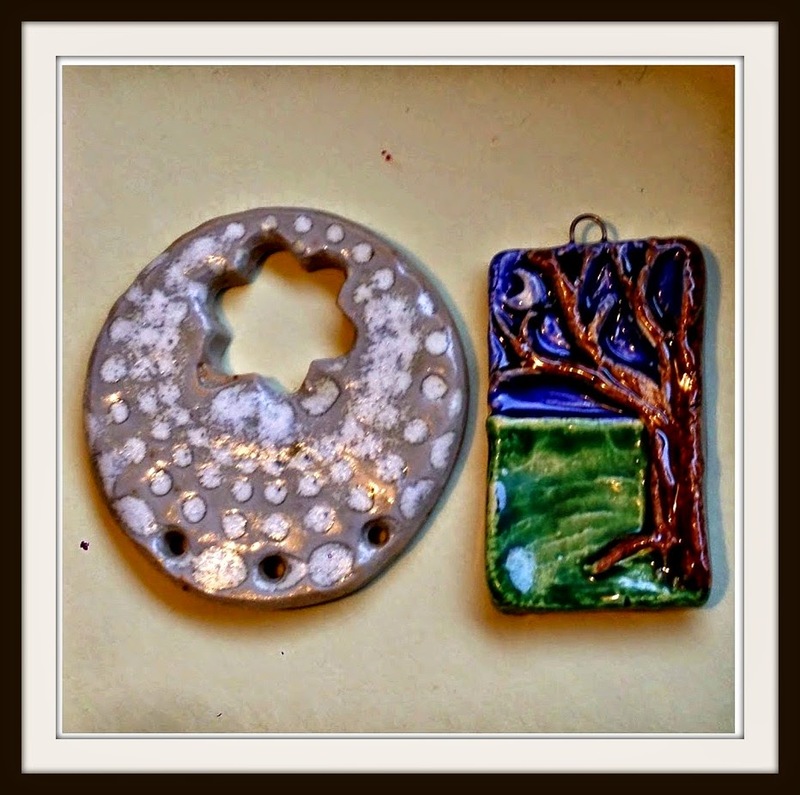 Gorgeous pendants and you certainly did them justice! I like the tribal feel of the first one and the sophisticate blending of silk and brass you used in the second. Aren't Jenny's pieces just fabulous?! 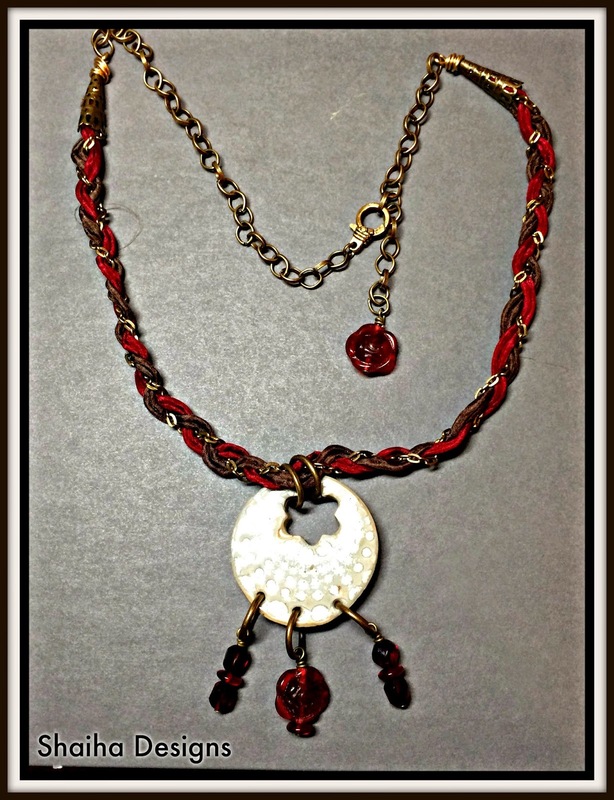 Love the first necklace - I have lots of that Indonesian glass in my stash - it does remind me changing of the seasons! But, I adore how you braided the silk in the second necklace! Fiber is just not something I am able to successfully incorporate into my work. The pops of red beads at the bottom is perfect with that lovely focal! I couldn't have chosen between them either! They're both beautiful, I love the vivd green in the first design. Hi Sha, I like that you kept the first design simple to showcase the lovely focal. Roses in the Snow is seriously AWESOME. Fantastic! Glad you got to play this month! How lucky to get two of Jenny's lovely pieces! The colours in the first one are fab and I love how you have used the second one it goes so beautifully with the red roses! 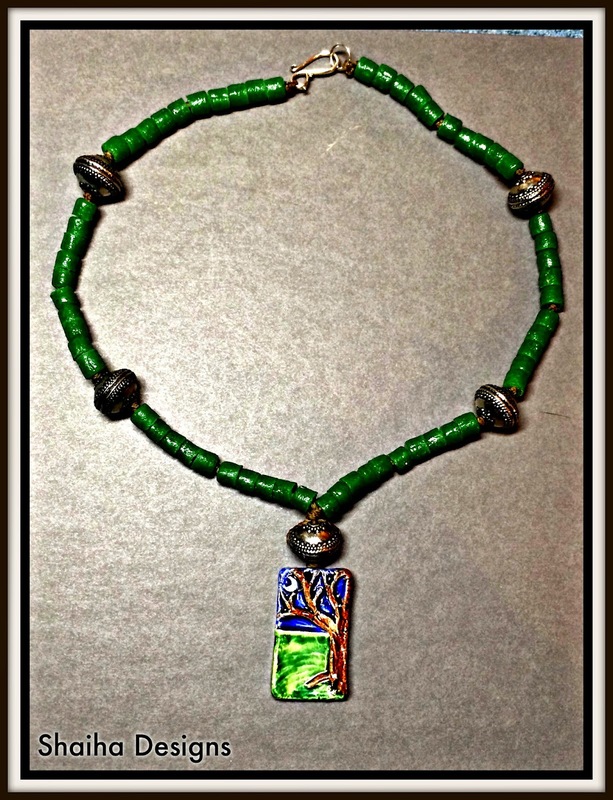 Lovely pieces, really like the green you used in the first necklace. I loved the green, too. Love the "rose" as well. I do love how you used the silk and chain in the second necklace. It really is beautiful together! I love the pendant of the first necklace. There is something magical about the air outside at night, and I love how you really played up the color in that pendant. There is no way I could have chosen between those two. I love trees and the other focal was just gorgeous also. You did a great job. These are awesome! I have one of Jennie's tree pendants I've been hoarding! Both are wonderful pieces! I couldn't have decided which one either :-) Thanks for participating in the design challenge and reading the blog! Very nice work. I especially like your idea to weave together the silk and chain. So clever. Oooh... I'm in love with your second necklace! Great idea to braid the two colors of silk and the chain. Great accentuation of the focal sin your designs...lovely work.